LACING: Very little. Just wisps, really. NOSE: Definitely a Scotch Ale. Sweet, sugary malt and dark, fresh-baked bread up front. Some banana fruitiness and bubblegum notes as well. TASTE: It’s mostly a Scotch Ale. A huge malt backbone is redolent with caramel, toffee, and a hint of peatiness. The Belgian yeast adds some fruit esters (bananas, prunes, and raisins) and a little funkiness on the back end. Finish is sticky-sweet and a little cloying. MOUTHFEEL: Heavier than medium-bodied, but I think that’s mostly due to the lack of carbonation. With better effervescence, this is probably a solidly medium-bodied and smooth brew. DRINKABILITY: I generally love Terrapin’s beer “mash-ups”, but this wasn’t their best. While Belgian yeasts add a fun wrinkle to most styles, perhaps Scotch Ales simply aren’t an appropriate medium for them. Or maybe this one-off brew just needs a little tweaking to make it perfect. I enjoyed it, but more as a novelty than anything else. Definitely worth seeking out, but not one of Terrapin’s finer efforts. Of course, even their worst efforts are better than what most breweries produce. 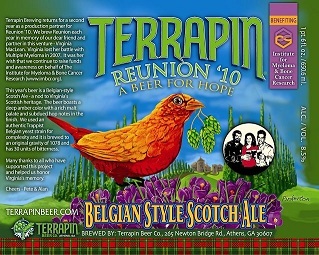 Posted in Tasting Notes.Tagged Atlanta, Belgian Yeast, Reunion '10, Scotch Ale, Terrapin.